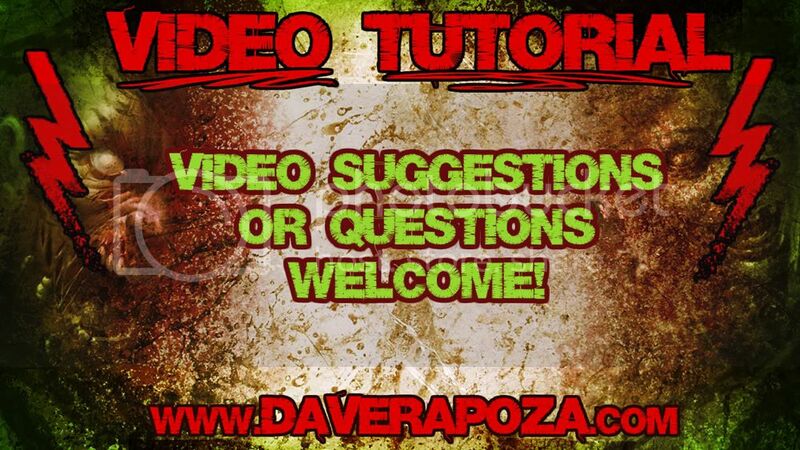 Dave Rapoza: Creating Sketchin Brush - Skype Reviews? Creating Sketchin Brush - Skype Reviews? Hey everybody! I got a few things to talk about today :). First off, things are finally flowin pretty good. The hard times I was talking about are pretty much over with! I'll be starting on my first set of Magic Cards at the end of the month and I'm really looking forward to it! Ever since I was 9 years old I've wanted to work on Magic so its been really awesome to finally have that dream realized. Not that its the ultimate goal for me but it was certainly on my list! I'm gonna put my everything into em and hopefully you'll see a lot more from me in the future :D.
Other than that I did up a new video on creating the custom sketchin brush I use in photoshop. This brush helped me a lot with my edges and whatnot so I hope you guys like it! Its a pretty standard custom brush that is simple and effective. My friend Devin Platts showed me how to make it a little while ago and I've been using it since. Before you watch the video though I'd like some input... I was watching the Chiu stream(Bobby Chiu's live streaming thing) and he mentioned having people make Skype calls to ask questions to the people he was interviewing. So I was thinking that maybe I could get some of you guys to call me(or I could call other concept artists/illustrators as well) and we could either discuss certain aspects of art/freelance/the industry in general... Or I could go over your own work and screen capture critiques? You'd just need a mic and a skype account! Let me know what you guys think of that and I'll start brainstorming some ideas :). Please click here and view in HD! P.S. if you wanna know when updates are happenin on here you can always follow me on twitter as I always update on there when a post goes up. Skype thing sounds awesome.. In fact, I think I added you on my skype contacts a while ago to try and get you to do just that. :D Now to go watch that video. Dave, I'd be all over that. Just have to get a mic. I'm also an illustrator but I'm still in the day job, working the illustration in every other waking hour phase. I'd love to get some crits and feedback from you or just get together and talk shop. Your video a while back on doing a very strong value painting and then using some color layers to begin coloring was extremely helpful and I think it's going to help me hit a new level digitally. Here's my latest in progress using that method. Great, I'm looking forward to it! Nice, now you have to go and become a great artist! Looking forward to your studies! Yess, thanks for watchin! I hope the whole Skype thing ends up bein reall cool. Thanks for that brush demo - that was exactly the brush I have been trying to get in photoshop, just did not know how. Probably will be able to work more in photoshop now instead of 50/50 painter/photoshop which should save some time. Appreciate it lots! Grats on the magic card gig!!! That's awesome. Hope you can show your progress on those along the way. Glad I could help! Hope you can use it :)! Congrats Bro! You the man. Slayin dragons all over the place! I knew you'd get that magic connection - it's the power of attraction :) and of a HARD, DiSCIPLINED WORK ETHIC. Keep it up homegrown. YEAAAAAAAAAAAAAAAAAAAAAAAAAAA bra. I'm gonna take it to the topppppp wooooooooooooooooooooooo! Thanks Miksey. I'm gonna give you a call soon. Hmm, ok, I'll try it out. What exactly would you like to see? Just let me know what would help most and I'll try to focus in. Another great tutorial...you're rockin' my world Dave, and it's much appreciated. I, too have been using the Hard Round recommended by most everyone, and while I've gotten decent results, I pretty much struggled through each painting, trying to beat the brush into submission to get the effect I was looking for. So thanks to you (and Devin) for being so generous. Great! I know I used to hate using the hard round brush... So hopefully you can use this one to your benefit! I'll try and make a lot more tutorials! Is the the basic brush you use for the rest of the image as well? I know you use different brushes for texturing at times, but is this the essential 'go-to' brush or is it mainly for sketching? Don't mean to bogart this comment thread :) but I knocked out a quick sketch using this brush and some of the techniques in your videos. Thanks Dave - been curious what kind of brush you sketched with for a while now. Also, congrats on the Magic work! Great stuff, keep at it! Thanks for the brush tut!! Skype sounds like it would be rad! It would be fun to pic your brain a bit. Also, have you thought about doing a ustream cast?? Yea I've thought about it a bit, wasn't sure if I'd have time to do a regularly scheduled ustream though... Its easier for me now to work on videos whenever I have the free time. Maybe later on though when things are a bit more routine :). This tutorial is baller man thank you!! It's simple but it makes a surprisingly big difference to the way my studies are coming out. Probably minute for minute the most useful thing I've seen in ages. Thanks for the information on the brushes that was very helpful and exactly what I was asking about. Also the skype idea sounds like an awesome idea. Congrats on your "Magic" job I used to be obsessed with that game when i was a kid! I'd look forward to that as well, about the skype thing I mean. I think I need some input on getting better Illustrations. I am also looking to get freelance work from WOTC. I had a pretty okay review with them. I need the edge, the Rapoza edge. I still ain't calling you Delicious. LOL. Very useful tutorial! I'm trying it out and it's great! I've been watching some of your videos, and I've seen you use another brush for sketching that looks to be more flat than this one and it looks like it has some texture, I saw it in some of the critiques videos. I'd really like to know more about that one too sometime.